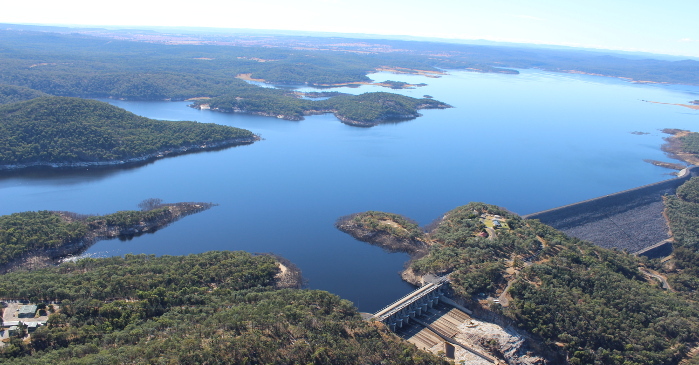 Copeton Dam is a popular inland sport and recreation destination near Inverell, offering year-round attractions for water sports and fishing enthusiasts, nature lovers, bushwalkers, campers and picnickers. The large lake’s extensive foreshores are home to a recently upgraded holiday park. The main purpose of the dam is to supply irrigation, stock and household needs in the Gwydir Valley, and environmental flows to the Gwydir Wetlands. Drive or walk across the dam wall for views of the lake and mountains. The rock embankment wall is 1.4 kilometres long and 113 metres high. Lookout on one side of the large spillway just east of the dam wall provide excellent views of the lake upstream. Office is open 9am to 5pm daily. Phone 02 6723 6269. Copeton Dam is 35 kilometres south-west of Inverell on the north west slopes of NSW Northern Tablelands. Inverell is 570 kilometres north of Sydney via the Pacific Highway and Thunderbolts Way. Reflections Holiday Park - Copeton Waters on the dam’s southern side provides a range of accommodation options. Camping is also available on the northern foreshore of the dam. The large lake offers skiing, jet skis, sailing, canoeing and swimming. Copeton Waters Park has several boat ramps. Fishing includes Murray cod, Golden perch (yellow belly), silver perch, redfin and catfish. Copeton Dam is situated on the Gwydir River about 60 kilometres upstream of Bingara and 35 kilometres south-west of Inverell on the north west slopes of the NSW Northern Tablelands. The dam is about 570 kilometres north of Sydney. Copeton Dam is one of the largest inland dams in NSW with a capacity of 1,364,000 megalitres, nearly three times that of Sydney Harbour. A dam on the Gwydir River was proposed as early as they 1930s to improve town water supplies and boost agricultural production in the Gwydir Valley. World War II and subsequent shortage of funds halted further investigations. It was 1966 before a final site was chosen and construction began in 1968. Cotton was one of the main crops to benefit from the availability of irrigation, as well as lucerne, cereals, oilseed, pecans, wheat and vegetables. The dam also provides environmental flows to the Gwydir Wetlands near Moree. In addition to irrigated agriculture and environmental flows, the dam provides water for Inverell and other town supplies, industry and domestic requirements, flood mitigation and recreation. A 21 megawatt hydroelectric power station uses summer irrigation, environmental flows and flood mitigation. Copeton Dam is a rock-fill embankment with a clay core. The rock wall is 1,484 metres long and 113 metres high. A concrete spillway is located just west of the dam wall. The spillway allows flood waters to pass through nine radial gates and concrete chute. Construction began in 1968 and finished in 1973 with a storage capacity of 863,000 megalitres. In 1976 construction was completed on nine radial gates in the spillway, increasing storage to its current capacity of 1,364,000 megalitres. To meet modern dam safety standards, a 250 metre wide and 11 metre deep fuse plug spillway was constructed at Diamond Bay just east of the dam wall. Completed in 2013, the additional spillway will divert floodwaters around the dam in a rare and extreme flood so as to protect the dam and ensure it remains safe in an extreme flood.